I just got back home after attending a housewarming party and am slated to attend one in the evening (Really hectic isn’t it). However, attending these housewarming parties got me thinking on the money that is required to finance them and ultimately, these thoughts waded into the land of housing loans (Well, you can call it a disadvantage of reading personal finance stuff the entire day 😛 ). Keeping the jokes aside , it is important to understand that most of us are going to buy a home sooner or later and hence, it is of extreme importance to know “how the housing loans can save us some money”. 1. The information is dispersed and unorganized. 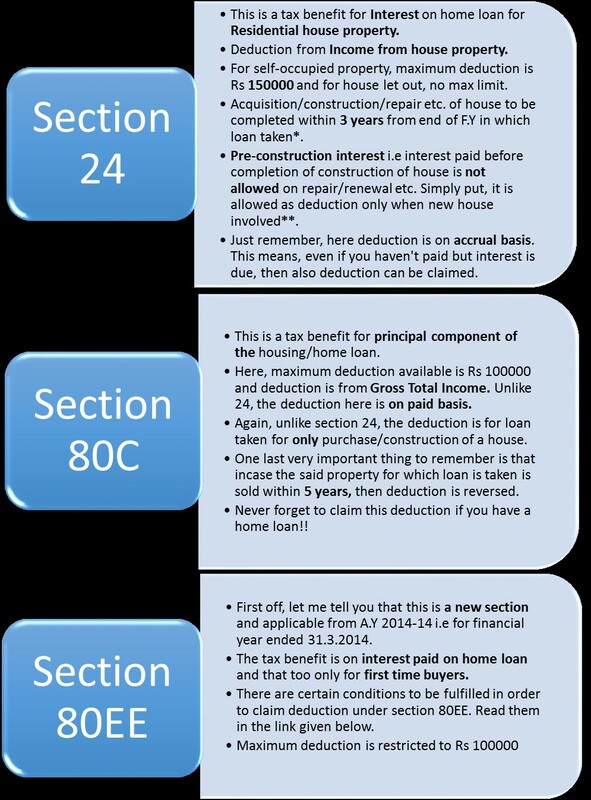 After looking for long myself, I found that there is no comprehensive picture that presents home loan tax benefits in one page. 2. Well, as other finance stuff, a lot of information in this regard makes it boring. This picture above refers the way tax can be reduced under the Income Tax Act, 1961 if you have taken a home loan and are paying interest on it. Here is the link to conditions prescribed under section 80EE. Do Have a LOOK. * So if you took the loan in year 2013-2014 then the construction/renewal/repair etc. should be completed within 3 years from 31.3.2014. Thus, the significant date is 31.3.2017. ** Pre-construction interest is allowed on construction/acquisition etc. on a pro-rata basis. So, if Mr F (just didn’t want to use X) took a loan of Rs 10 lacs in 2010 to build a house and pays interest @10% per annum. Now say the construction got over on in 2012 then the amount of pre-construction interest works out to be Rs 2 lacs for two years. As per law, this interest will be allowed for 5 years i.e 2013 to 2018. Logically, the amount of deduction in each year would be Rs 40000 (Rs 200000/5 years). Remember this example for pre-construction period and that’s it!! Author’s note: Well, I just used the term author’s note because it sounds kinda professional and exciting. But that doesn’t mean, I have nothing to say. So, in my opinion, sections 80C and 80EE are relatively easier and less complicated sections and can be implemented while filing your taxes without any outsider help. However, for section 24, I would suggest that you should always seek some knowledgeable guy’s help before proceeding to claim deduction. Mehta Jr, you never told about this blog? Will soon reach out for expert advice on home loan and my complicated 2013-14 returns filing. Dude..I have been publishing FB posts toh! No worries but. Yes, we will talk about that soon.